Trade In Your Vinyl Siding and SAVE! Trade in your old siding and save up to $3,000 when you upgrade to Woodland 16′ Cedar Siding! We view all siding projects as long term investments. The return on your siding investment will be affected by the decisions you make with your contractor. Your home’s appearance, curb appeal, energy savings, interior comfort and maintenance are important decisions that your contractor should help you with before you invest in a siding project. Year after year, season after season, Solid Vinyl Siding from Capital Improvement performs like no other. Vinyl Siding protects the hard-earned investment you’ve made in your home. Covering your home with Vinyl Siding from Capital Improvement can increase its market value. 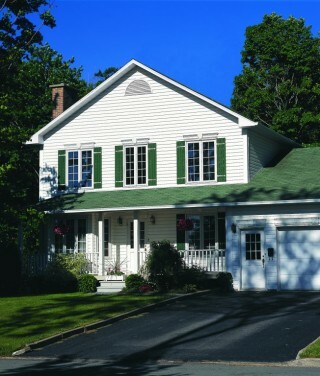 Capital Improvement offers a wide selection of siding choices to meet your needs and budget. All of our siding products come complete with a beautiful selection of dependable accessories in an array of matching or contrasting colors. Vinyl is now the number-one siding material available and for good reason: Nothing beats vinyl siding, accessories and trim for sheer endurance. Unlike many other siding materials, vinyl is impervious to rain, cold, salt and snow. Vinyl won’t rot, peel, dent or show scratches, nor will it ever need painting. A simple soap-and-water rinse once a year is all that’s required to remove dirt and maintain the look of freshly painted wood. Today’s vinyl siding panels offer exceptional durability and weather resistance, and come in a variety of attractive styles, textures and colors. Vinyl provides enduring beauty and design flexibility. Using a variety of siding and soffit styles, colors, accessories and trim, you can update a ranch, add character to a colonial or even recreate a Victorian. Moreover, you can select siding that will be consistent with your home’s design and fit into the environment and neighboring homes. Unlike conventional vinyl siding, which may have glossy finishes and exaggerated wood grain, today’s vinyl siding provides a beautiful low-gloss finish that looks just like painted wood. Vinyl siding is a great investment. Re-siding a home is among the top ten remodeling projects in terms of overall payback. If you re-side with vinyl, you can often recoup 100% or more of your investment. 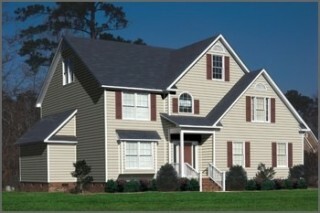 Capital Improvement uses only quality brand vinyl siding from the most trusted names in the industry.